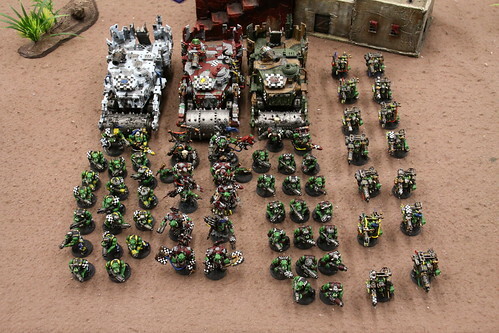 For our current 1500 point tournament scene I've been toying around with this Ork list and hope to take it through some play-testing sessions. 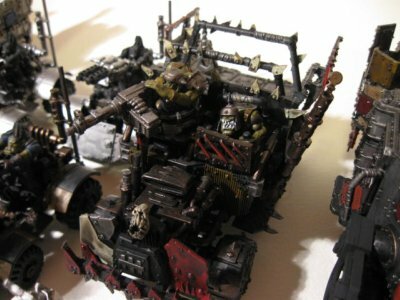 This list has almost all the most powerful units in the Ork codex: Lootas, Deffrolla Wagons, Kustom Force Field Mek, and Nobz. It's a potent mix of close combat power, mid range shooting and long range fire support. 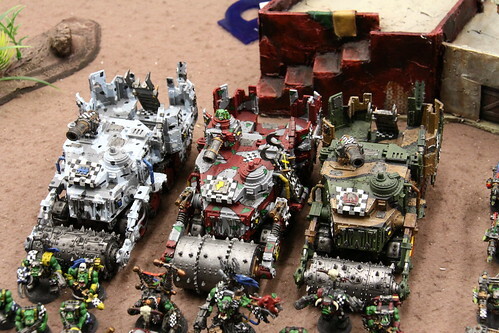 Orks struggle to deal with AV 13 and AV 14 vehicles. 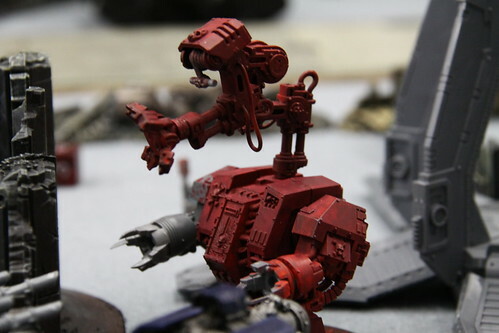 Deffkoptas can help balance that by assaulting the more vulnerable rear armor of targets like Leman Russ or Predators. Shoota boyz are a potent force when camped in the back of a battlewagon. 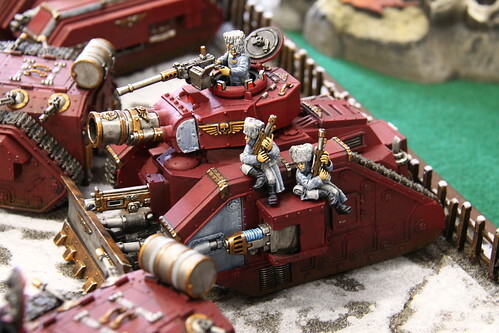 They have a solid shooting platform to unload their shootas from and have the option of pumping 30+ shoota rounds into an enemy from the safety of the wagon, or debarking and charging following their firing. I find Nobz to be a valuable troop to deal with enemy death star units. The cybork body combined with feel no pain provided by the pain boy is a resilient combination. 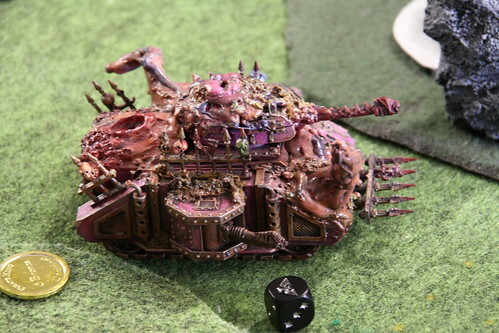 The double power klaws in the unit (a 3rd if joined by the Warboss) can lay waste to a large number of enemy HQ's, Monstrous Creatures, or other heavily armored enemy units. Trukks are fragile but can find cover behind the larger battlewagons. 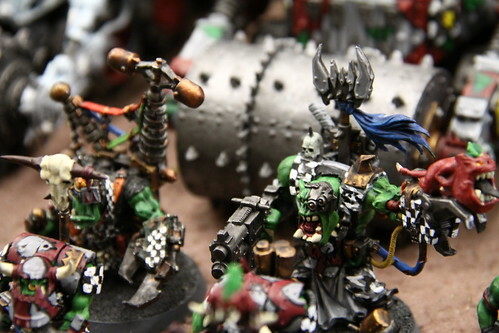 They are an inexpensive way of getting nobz across the table. 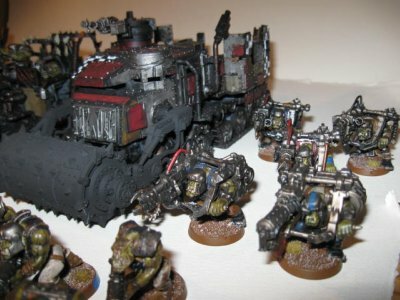 The Lootas, Deffkoptas and Warbuggies provide the necessary fire support for this list, enabling the rest of the army to get where it needs to go in one piece. 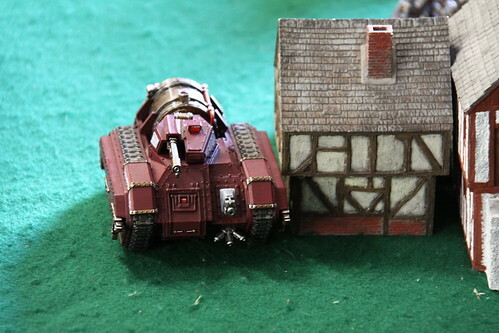 Lootas can stun or shoot dead most heavy artillery on the enemies side of the table starting on turn one. Buggies can maneuver and achieve a similar result. Deffkoptas can scout or outflank to assault enemy vehicles where their armor is weakest. 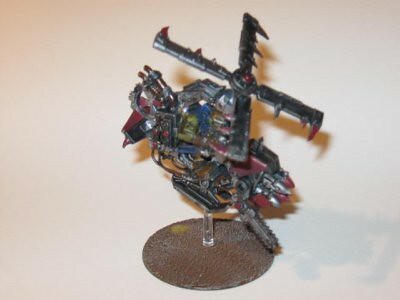 They are the kamikaze fighters of the ork codex and rarely leave enemy vehicles, or themselves, standing. 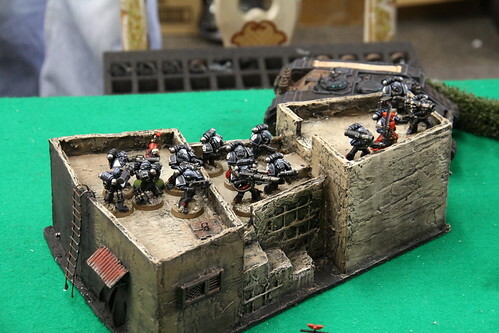 Lootas provide vital fire support to obliterate enemy vehicle kill from a distance giving the deffrolla wagons and their payload of boyz the opportunity to close the gap. The deffrolla wagons are both a shooting platform for the boyz and a devastating ramming attack to level enemy vehicles. Once close they can pummel almost anything with great effect and even crush mighty Monolith's or Land Raider's dead under the weight of their deffrollas. Finally the KFF Mek is a common combination with the vehicles it protects. Since the force field provides obscurement for anything with 6" a savvy general can give almost his entire army a 4+ cover save so long as he stays on the table. The Kustom Force Field Mek is always happy to provide 4+ cover to nearby vehicles. 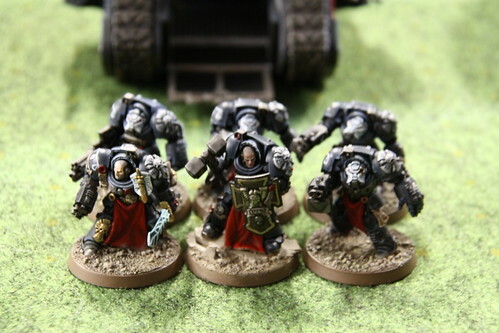 Since the Assault on Black Reach (AoBR) set was released, I have managed to collect about three sets worth of AoBR Space Marines, as a result of helping friends get the Deffkoptas they wanted for their Ork armies. However, I consider myself a Chaos fan, since Chaos Wins after all, and was not really interested in painting the miniatures myself. 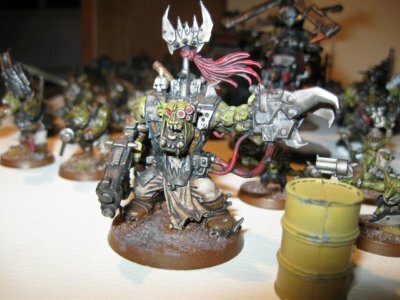 I was also not too interested in investing a lot of money into the paint job for these models, since I want to focus any significant money I spend on Chaos! This led me to look around the internet for convenient and affordable miniature painting. As a result, I found Hulksmash Studios. I initially learned about Hulksmash on DakkaDakka.com and the local tournament scene. Then, during my search for painting services, I learned he offered such. After looking at his prices, and with the added bonus that he is within driving distance from where I live (saves on shipping costs), I decided to give him a try. 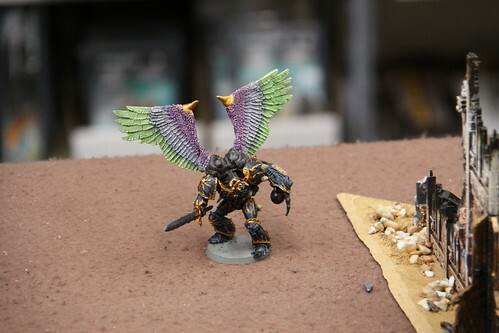 I had already built the models, so all that was left was for him to paint them. For the price, this was a great deal. 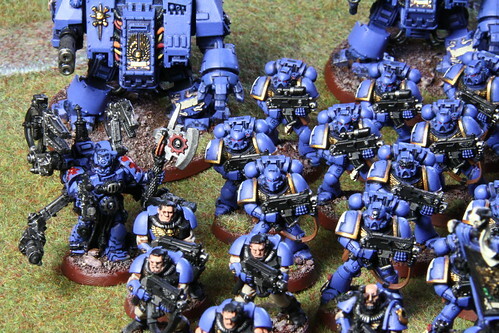 As a result, I have already given him more Ultramarines to paint. 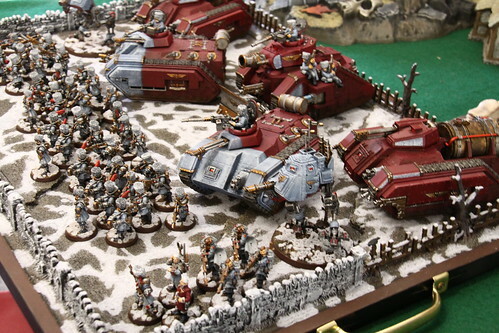 Our latest tournament pitted 12 players fighting for the top prize with 1500 point armies. 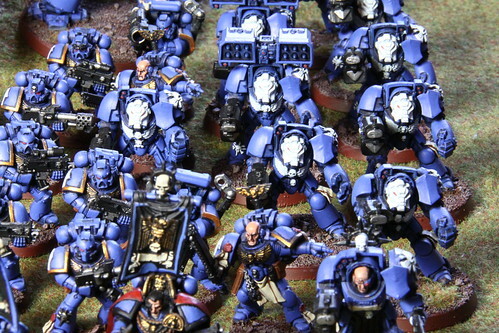 9 of the armies featured some type of space marine variant with 3 of those being Chaos and another 3 the popular Blood Angels. 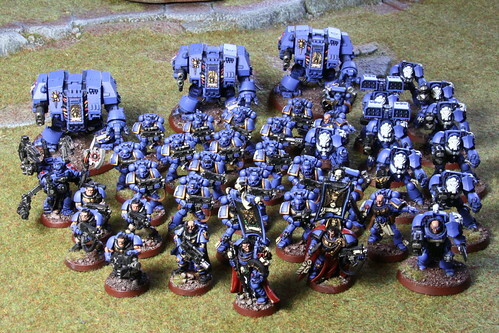 Blood Angels, led by Mephiston, captured 2 of the top 3 slots in the Swiss and as of now are clearly the army to beat. Place Name                          Score   Buch. Progr. Berg. Company Command Squad (Carapace Armor, Camo Cloaks, Sniper x4) w Master of Ordinance and Officer of the Fleet. After a great weekend, another tournament is in the bag. 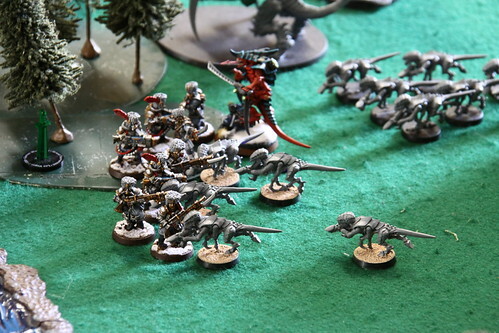 For starts, my organizer based Army Comp, used for Game 1 and Game 2 pairings, was 8.5, with my peers having a high of 12.5 and a low of 2 so I was right in the middle. 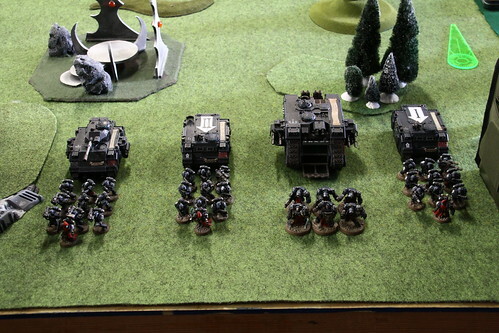 Other armies with an 8.5 were a Dark Eldar list, a Tau list, and another Imperial Guard list. With an 8.5, my first opponent was Silas Burdick and his Dark Eldar. This was a great first game. 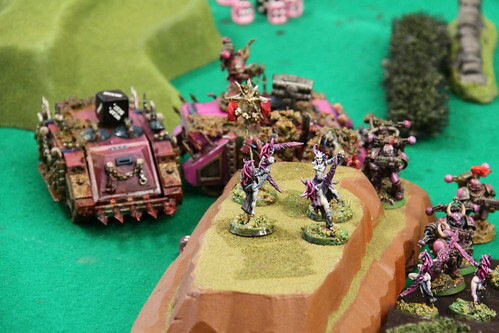 I had a chance to play against Silas' Dark Eldar at the Broadside Bash earlier this year and it was great and this game was no different. Much like the results of the Broadside Bash, due to my poor generalship and his good generalship, I lost this first match. The mission was a modified Dawn of War with 3 Objectives. For objectives, it was a draw. However, I wasn't paying attention to the secondary objectives, for which I could have easily obtained, but space out. I lose 7-10. A great game against a great opponent. My next opponent was Wayne Kaufman. Amazing, he also was playing Dark Eldar. This was also a Army Comp pairing and Wayne had a score of 9, higher means the list was "less hard." This was a reverse kill points mission. I initially had initiative, but my opponent siezed. Base on some of my scout moves that put me in a compromising position, I thought that I might be in trouble. However, my opponent had a run of bad luck and I survived the first turn unscathed. In response, I made short work oh his army. I win 13-1. I missed out on most of the secondary and bonus objectives, but I was happy with the results. 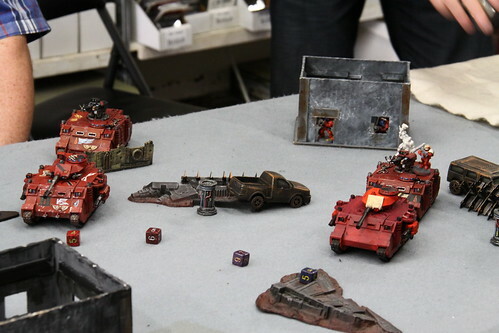 My third game was the first battle point paired mission and I was paired up with Jeff Kaminsky and his Chaos Space Marines. This was a modified pitched battle, "destroy" objectives, mission. I won initiative. Jeff had initially decided to hold everything in reserve, but I reminded him that if he holds everything in reserve, with my skimmer scouts that hold troops, that I would destroy his objectives before he even had a chance to be on the board, and gave him a chance to change his mind, which he did. In the future, I have decided to just take the win, but I really didn't want to win that way. So with the revised deployment, we had a hard fought battle and tied 9-9. 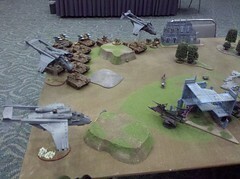 Game 4 was against my good friend Ryan Shephard and his Imperial Guard. This mission was about getting points for detroying all units in a each of the Elite, Troop, Fast Attack, and Heavy FOC slots. Unfortunately, there was also a preliminary bombardment aspect of the mission that left 90% of my vehicles stunned on round 1. As a result, I was fighting an uphill battle, but managed to eek out a loss but at 12-15. 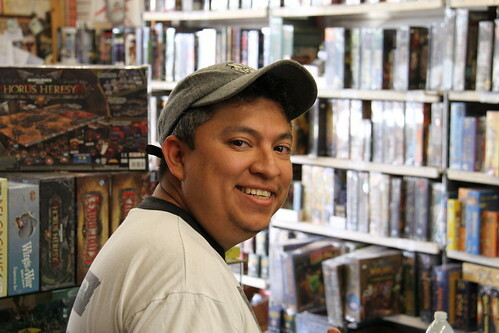 My last game was agaist Sergio Alvarez' Blood Angels. 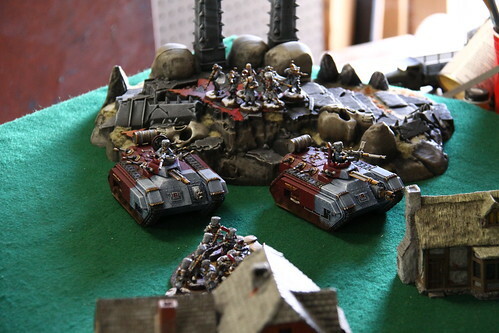 This was a Spearhead Slaughter Style kill points, with Table Quarters as secondary, mission. I won initiative and the Blood Angels tried to hide. 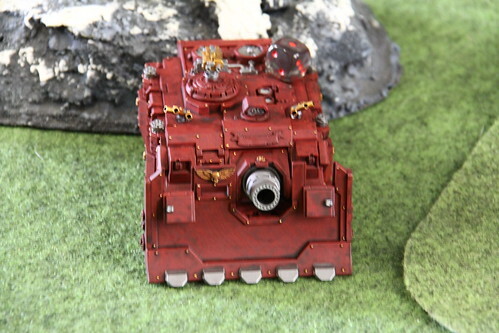 Unfortunately for the Blood Angels, the Manticore don't care where you hide and I managed to severly hurt their mobility for the rest of the game and slowly grinded through most of his army resluting in a win, 16-4. The total was 57 battle points, which gave me 9th out of 28 in battle points. For Opponent Scored Sportsmanship, I got a 29 out of 30. I am not sure who dinged me, but I did do an illegal scout move in game 2, which was later corrected, but I can see how I could have deserved a rules ding. Mistakes happen, but it is a tournament and I need to pay better attention. For Opponent Scored Comp, I got a 24 out of 30. This didn't surprise me, until I noticed that the average was around 29 and that I had the second lowest opponent scored comp at the tournament. Just more evidence towards how arbitrary it really is. My paint score was 27 out of 40. This didn't surprise me and was better than what I got at Broadside Bash, so I guess I am happy with it. I know my vehicles are a bit bland, being mostly brown and most of the detail is really subdued. 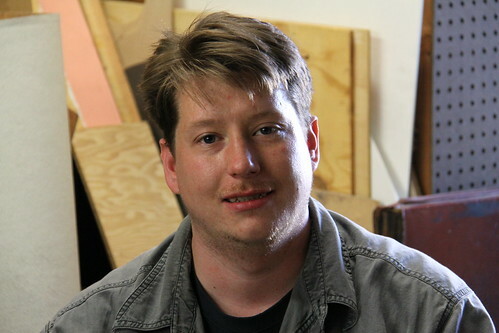 I really prefer the natural, grimy, look for my renegades, and I am still a novice (color blind) painter. So I'll take what I can get. This gave me a total of 137 points and 14th overall. I seem to have a knack for scoring middle of the pack. There is definitely room for improvement. I can't control comp, and I can't control sportsmanship, but I definitely and going to try to become a better painter, and I already noted all of the mistakes I made during play to help me improve my generalship. * Never forget the secondary objectives, if they exist. * Don't give a win away. Remember its tournament and play to win. Be nice while doing it, but don't absorb someone elses mistakes, since odds are they won't do the same. * I've done my scout moves so many times, I should never forget the 12" space. No excuses for shoddy play. In chess tournaments winners are usually paired with winners and strength of schedule matters. 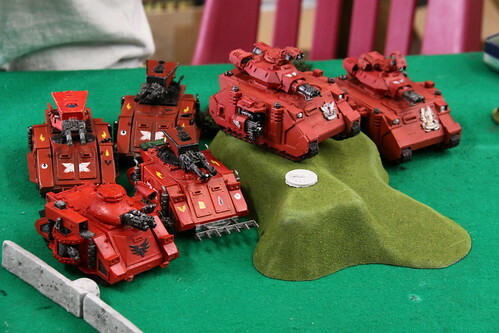 In 40k this isn't always the case because the Swiss pairing system isn't always used. Swiss pairing is one of the most common ways to run competitive tournament games. It is commonly used for chess tournaments, and also bridge, backgammon, and Magic: The Gathering. 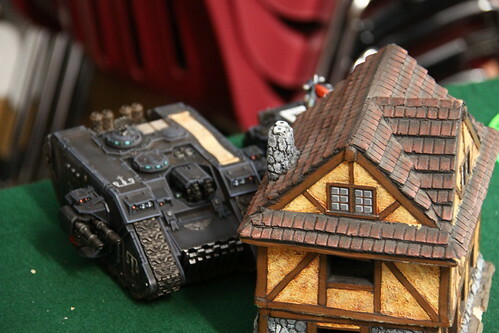 40k tournaments eschew Swiss pairing and instead use a variety of methods for pairing. Some are based on army composition scores. Some are based on schedule strength, and some completely random. Many tournaments use any and all of these but almost none of them use pure Swiss pairings. These inconsistencies in how pairings are done at tournaments can really warp a meta-game. Quality lists are often comp paired with other "competitive" lists in the early rounds of grand tournaments. This forces players with top tier lists to play against each other in the early rounds regardless of tournament performance, and forces players with low tier lists to do the same. The result in later rounds when comp pairing is abandoned are often bizarre mismatches of highly competitive and low competitive lists. When the battle point blowout scores are then factored in things can really get out of hand. True Swiss pairings always randomize the pairings in round 1, and then pair off winners in the later rounds. This results in the players with the best results playing each other as the tournament progresses. 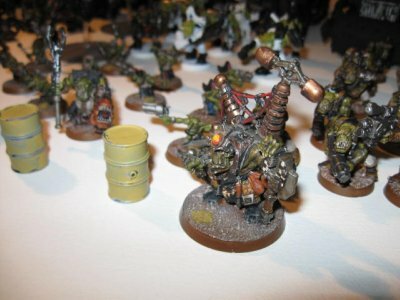 Can Swiss pairings and win, lose or draw scoring be applied to 40k tournaments? Most certainly. The challenge is putting together a functional tie-breaker system that is satisfactory to players. One component of Swiss pairings is that the more players you have the more rounds you need to play. 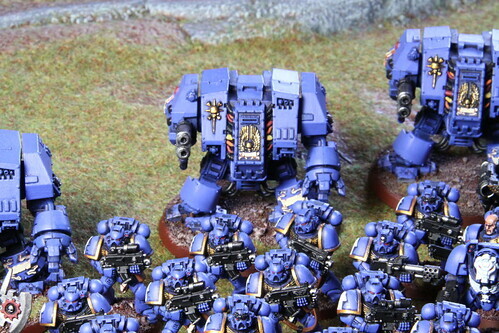 In 40k, especially at the RTT level, this is often not possible. However, if proper scoring methods and proper tie breakers are employed then most tournaments winners can be determined fairly. For scoring, points are awarded based on a win, loss, or tie result. In sanctioned chess tournaments, 1 point is granted for a win, .5 point for a tie, and 0 for a loss. This is a system that can also be easily applied to 40k. 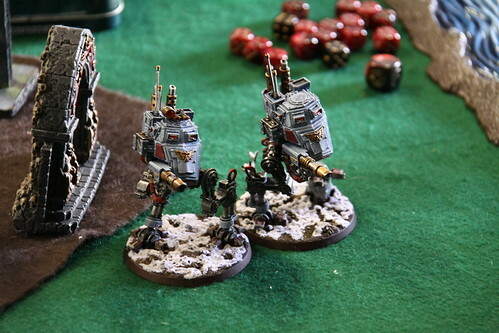 Unlike many 40k tournaments, massacre scoring or margin of victory scoring is not relevant in this type of scoring system. All that is relevant is a win, loss or tie. Tiebreakers are always employed using a priority method. You determine which tiebreakers are going to be used and then assign a priority to each. If the first tiebreaker cannot determine a winner because that tiebreaker is also a tie, then you go to the second tiebreaker and so on down the line. The above methods are commonly used in competitive Swiss tournaments. The explanations are as follows. Head to Head: This one is straight forward. If two opponents played each other during the tournament but happen to finish the tournament with an identical record, then the winner of their game becomes the tiebreaker. This one is obvious, completely fair, and can resolve a tie between two 2-1 records quite easily. However it may not be applicable if the two players don't play each other or if they play each other and tie their game. Solkhoff: Outside of chess circles this is more widely known as the strength of schedule tie breaker. 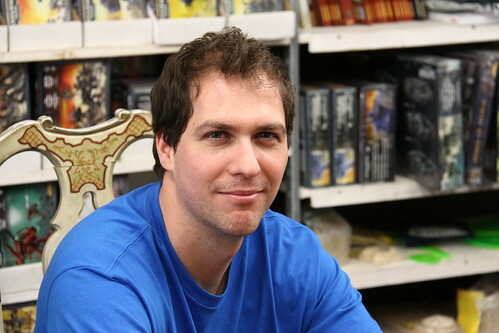 The better the results of a players opponents' during the tournament the higher the Solkhoff score will be. Cumulative: Cumulative scoring places more weight on games won in the early rounds of the tournament and less weight on later rounds. The rationale for this system is that a player who scored well early in the tournament has most likely faced tougher opponents in later rounds and should therefore be favored over a player who scored poorly in the start before subsequently scoring points against weaker opponents. Sonneborn-Berger: This is essentially a modified version of the Solkhoff tiebreaker method, but places less weight on ties. With 4 tie-breakers used, the chances of an actual tie that cannot be broken at the end of tournament are rare. In our most recent RTT we did end up going to tiebreakers. This was to be expected in a tournament with only 3 rounds of Swiss and Eleven players. Both players finished the tournament 2-0-1 and their tie was against each other. This made the head to head tiebreaker moot so we moved onto Solkhoff where it was determined one player had a tougher schedule than the other. While this might disappoint the second place player with this result, it was pointed out to him that he did have an opportunity to win the tournament outright had he simply won his game against the champion instead of tying.